Shortly after a catastrophic fire ravaged Notre Dame de Paris, speculation emerged that this event had been foreseen by perhaps the world's most famous prognosticator. 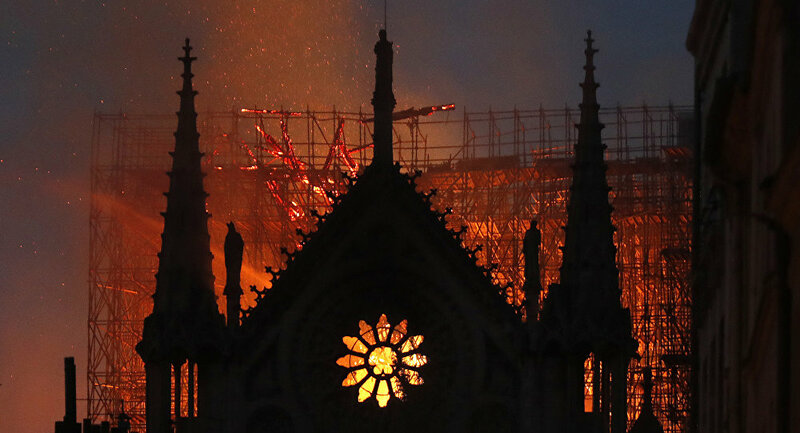 British astrologer Jessica Adams believes that Monday's Notre Dame fire was a Nostradamus prediction that came true. Nostradamus, a 16th century French astrologer and physician, compiled a book of quatrains (verses) that allegedly predicted future events. They were divided into 100 sections called Centuries and made up the book Les Prophéties (The Prophecies). Most of these so-called prophecies are vaguely-worded and open to a reader's interpretation; some verses have been attributed to different events that took place centuries apart. France and Italy, what emotions will you undergo?" She claims that the placement of planets and zodiac signs on the astrological chart for 15 April 2019 matches what happened on Monday. "What we have here is Chiron indeed at ‘the head of Aries' at just three degrees of the zodiac sign. The sun, burning orange at sunset in Paris as Notre Dame fell, is also in Aries, in this astrological chart set for Monday 15 April 2019 at 5:50 p.m., Paris, France," she writes. "The shock of the moment is shown by Uranus at 2 Taurus, making an almost exact semi-sextile to Chiron. In fact, this is a line-up which could only happen once every 80 years. The Moon is at 3 Virgo, exactly quincunx Chiron." "What is Chiron? A symbol of people and organisations which are audacious. Outrageous. Which get away with the so-called impossible. In a moment I will look at WikiLeaks, Julian Assange and a well-known Syria Files post from them, some years ago, called The Notre Dame Prophecy. Yes, you did read that right. The Notre Dame Prophecy." As firefighters were battling with the blaze, French President Emmanuel Macron issued a statement. "Notre-Dame is engulfed in flames," he said. "Emotion of the whole nation. Thoughts are with Catholics and all the French. Like all citizens, I am sad to see this part of us burn." Adams believes this is another evidence that Nostradamus' verse was referring to the cathedral, as the word ‘emotion' appears in the fourth line, while part of the president's first name — which is translated from Hebrew as ‘God with us' — appears in the second line. Incidentally, the Notre Dame fire broke out during Holy Week and came at a time when the Catholic Church has been rocked by a widening sexual abuse scandal. Last week, Pope Benedict XVI blamed sexual abuse in the clergy on the "all-out sexual freedom" of the 1960s; some scaremongers say this could be a sing of the end times. — Grease Witherspoon (@RealDeweyFinn) 15 апреля 2019 г. — Ec. Angelo Palacios (@angelopalacios) 15 апреля 2019 г. — David Leavitt (@David_Leavitt) 15 апреля 2019 г. — Gottfried Emmanuel Schmer (@gottfriedschmer) 15 апреля 2019 г. Although the devastating fire dealt heavy damage to the cathedral's exterior, toppling its spire and making the roof collapse, some of the interior appeared to remain intact. The altar and altar cross were preserved, for instance, and some commenters called it a "sign from God". — Dan O'Donnell (@DanODonnellShow) 16 апреля 2019 г. — anna volenec (@annavolenec) 16 апреля 2019 г. — Tommie Sunshine 😎✊️🌹 (@tommiesunshine) 15 апреля 2019 г. It also emerged on Monday that a small fire broke out inside al-Aqsa mosque in Jerusalem at the same time the mammoth fire engulfed Notre Dame. However, the blaze in the Jerusalem mosque, one of the holiest sites in Islam, was swiftly put out. — wan (@eskerettt) 16 апреля 2019 г.